The content marketplace is broken. 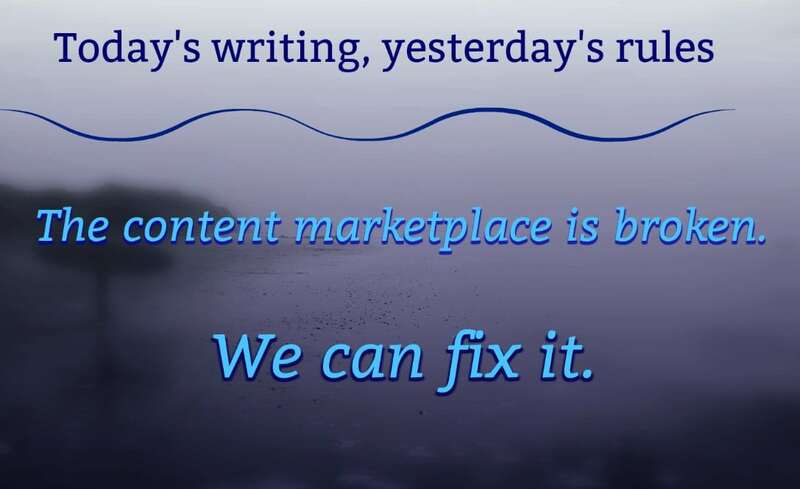 Not content marketing itself, but the content marketplace: how content is bought, sold, evaluated, published, attributed, etc. I graduated from college in 1989 with a degree in Journalism. Back then, your content portfolio was everything. Back then, that made sense: There were only so many outlets where your writing could be published, so those clips were worth their weight in gold. They proved that you had what it took to stand out from all the wannabees and convince editors that you could write. But then the internet happened, and everything changed. Except, that is, the way we find, evaluate, and hire writers. As 2017 draws to a close, we’re still playing by the same rules we used back in the 1990s. And that just doesn’t make sense anymore. Here’s why. The internet is an all-you-can-eat buffet for content creators. And you don’t even need paying clients, thanks to personal blogs and platforms like Medium. So the fact that you have a portfolio full of content links doesn’t mean as much as it used to, because anybody can do it. Since it doesn’t have to be earned, it’s no longer proof of talent. Let’s face it: With the amount of branded content being published today, having somebody do the grunt work can be a lifesaver. And a great editor can turn crap into Hemingway. As squirmy as it may make you feel, you have absolutely no insight into what happened between the time a writer submitted a piece of content and the time it appeared online, all polished and sparkly. No. Idea. At. All. Unless you have a personal connection with someone at the site where the content was published, that byline doesn’t mean a whole lot. In other words, thanks to ghostwriting, a lack of bylines cannot be taken as proof that a writer hasn’t been published. Because that’s the thing about ghostwriting: When you sell full rights, that means the buyer can publish it under his or her own name or under no name at all. My “offline” portfolio — the one where I save links to my ghostwritten content — contains well over 200 published articles, covering approximately 70 topics across six different industries. But you’d never know that by looking at my “real” portfolio. Ghostwriting has been an incredibly disruptive change that has, by and large, stayed under the radar. But it’s obvious once you look at the numbers. According to the Content Marketing Institute’s 2016 report, 82% of B2B businesses publish content on company blogs. 64% of B2B marketers outsource that writing. But only slightly more than half of freelancers report receiving bylines, and even then, it’s sporadic. Only 11% say they always receive bylines. And that begs a question: Who the heck is writing all this content? Some of these brands undoubtedly use staff writers. 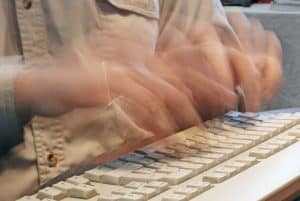 Others — and I may or may not know this through personal experience — use ghostwriters. And that’s not even counting the content that does give attribution — just not to the person who actually wrote it. Instead, the person named in the byline is a company executive, industry official, thought leader, etc. As far back as 2012, only 45% of CEOs wrote their own content, and that number is probably higher now. Don’t get me wrong: Ghostwriters sell a product as much as a service. We know what we’re getting into, and no one is taking advantage of us. I mention this only to illustrate how illogical it is to put so much weight on a writer’s portfolio when there’s evidence staring us right in the face that there are a lot of top-notch content writers out there whose portfolios don’t accurately reflect their talent and experience. If you’ve spent much time on my blog, you already know that this one drives me to distraction. Back when there was a clear distinction between journalism and marketing, niche expertise made sense: You had sports reporters, political reporters, business reporters, etc. And it worked, because reporters used the knowledge and contacts they gained over decades of experience to explain things in ways that were both accurate and easily consumable. (And also because, without the internet, most people couldn’t do their own research). But here’s the difference: Those journalists weren’t selling anything. They weren’t attempting to influence behavior. They were objective (or were supposed to be) and had no other goal than to tell the story. Content marketing couldn’t be more different, and yet we still choose writers as if the only goal is to disseminate information rather than to persuade, engage, earn trust, build a brand, etc. But the ability to dive into technical details of a product and the ability to make customers think they can’t live without a product are two very different things. Even in content marketing, there are times when you might need a technical expert — if you’re writing content for people who do what you do, for example. Or people who regulate what you do. Or if you’re trying to convince investors to finance what you do. How is subject-matter expertise going to help a writer explain that your prices are going up due to civil unrest in the region where you get your raw materials? Will a subject-matter expert be able to make the leap from describing features to connecting with customers on an emotional level based on benefits? Will a subject-matter expert be able to overcome the curse of knowledge and the resulting tendency to talk to potential customers as if they’re at the bottom of the sales funnel when they actually have no idea what you sell or why they would need it? Will a subject-matter expert be able to focus on keywords that customers would search for, or would they use technical terms that customers may have never even heard of? Could it simply be a matter of semantics? CMI recently published a post on how to turn a content writer into an industry expert. But, if you look closely, their recommendations have a lot more to do with business knowledge than industry knowledge. Learning the audience, assessing the competitive landscape, learning about the product from both a features perspective and a benefits perspective…those aren’t specific to a particular industry. They represent a framework for understanding business — one that, once you understand it, can be easily transferred from one niche to another. It’s not the first time I’ve wondered whether, when marketers say they need writers who are industry experts, what they actually mean is that they need business experts. I want to be very clear: I’m not whining that the system is unfair, I’m not casting blame, and I’m not making excuses. What I am doing is shining a spotlight on the the elephant in the room: The internet has already disrupted the business of content creation and distribution, so it’s high time we stop evaluating content marketing writers by the same criteria print publications once used to hire journalists. And it’s gong to take a fundamental shift in thinking from both writers and brands. Some ghostwriters use contracts that include a stipulation that the writer can use the content for marketing purposes. I don’t include that as a default, but I do sometimes offer discounts — one for a byline and another for written permission to include the content in my portfolio. It depends on whether I think that particular piece of content will add something of value to my portfolio. Disclaimer: Don’t do this without permission. When you provide ghostwriting services, it’s like selling a product. You don’t own it anymore. You wouldn’t sell a car, then go take it from the customer’s driveway to go out for a joyride. So — no cheating. Testimonials can be almost as tricky as portfolio links. If a well-known thought leader contributes a testimonial to your website, people are going to start wondering what you wrote for them. It’s a credibility risk. What you could do, however, is offer to identify the client only by title and industry rather than by name. Another hack for collecting good testimonials: Offer to write them yourself (with the client’s permission, of course). If the client agrees, write it up and submit it for approval before you post it. If you can’t link to particular pieces of content, list them (no links) by industry and topic, as I do on my portfolio page. If your portfolio is thin in terms of demonstrating a certain skill or area of expertise, use your blog to fill in the gaps. Just make sure that your blog posts reflect the same kind of quality and insight as the paid work you do for clients. And distribute your posts in a way that underscores your mastery of social promotion. Be clear about what you do — and about what you don’t do. If you know you’re not a good fit for a certain type of client, say so up front so they don’t waste any more time. Use your website’s “Home” and “About” pages to describe your approach to content marketing and to working with clients. Just knowing that you have a process goes a long way toward creating confidence, because it demonstrates that you’ve done enough work to know what works and what doesn’t. And I’ll toss in one last tip: If you’re like me and have upped your skill level over the years, Google your name every now and then — and then delete any work you’re no longer proud to claim. This isn’t about what you should do for writers. I was raised by Greatest Generation parents who would have smacked me upside the head if they heard me prattling on about what somebody owes me. This is about what you can do to help yourself, your business, and your brand. How do you find and evaluate content writers? 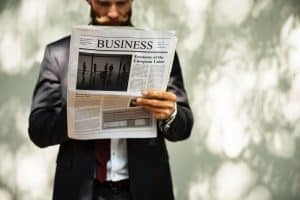 Are you relying on the tired, old journalistic criteria, or are you using criteria based on your business’s current needs? How are those hiring methods working for you? Are the writers you hire based on your chosen criteria delivering what you need? Or do you always feel a bit disappointed? If there’s a gap, how can you change your recruitment and vetting processes to close it? If you use ghostwriters, would you be OK with them including your content in their portfolios, or with listing you as a client? If not, then ask yourself how fair it is to reject a writer for failing to provide links when you know good and well you wouldn’t let the writers you hire link to your content. We established earlier that bylines are now more about ownership than authorship. Just as the lack of a byline doesn’t prove that a writer hasn’t been published, the presence of a byline doesn’t mean that the writer has been published. I don’t know of any incidents of this first-hand, but it’s entirely possible that a writer could hire a ghostwriter to help pad their portfolio. Just remember — it works both ways. Our assumptions about interview questions are almost as outdated as our assumptions about portfolios. Forget all those stale questions like, “Tell me about a time when you…”. Just talk about what’s going on in the world of content marketing, in business, or in the world at large. Feeling doubtful? Think about the last time you went to a lame cocktail party or a boring conference. How long did it take you tell whether somebody knew what they were talking about or was just blowing smoke? About 30 seconds, right? Imagine what you could learn about a content writer in a meaningful five-minute conversation. What do you think? Is it time to have a conversation about whether the traditional ways of evaluating writers make sense for today’s content marketing? I’d love for you to share your insights and experiences below. PreviousTrick or trust: How does your content measure up?